Custom Dynamics® Magic Tour-Pak® Converter works in conjunction with the SMART Triple Play® to provide run, brake, and turn function and 10 selectable brake flash/strobe patterns up to the Tour-Pak®. Installation of the Magic Tour-Pak® Converter adds turn signal functionality to rear taillights (stock run and brake) and adds brake/turn signal functionality to side marker lights (stock run only). The use of this product requires a SMART Signal Stabilizer™, SMART Triple Play® Unit, LED rear turn signal conversion, LED taillight conversion, and LED Tour-Pak® conversion. Bike must be equipped with Custom Dynamics® products. Fits 2006-2013 Electra Glide® Ultra Classic/Limited models and 2011-2013 Road Glide® Ultra models equipped with OEM Ultra Tour-Pak® or King Style Tour-Pak® with 1157 incandescent bulbs. Must be used in conjunction with Custom Dynamics® Smart Triple Play® Unit. Must convert rear turn signals to LED. Also fits 2008-2013 Tri Glide® models. Must be used in conjunction with Custom Dynamics® Smart Triple Play® Unit. Must convert rear run/brake/turn taillights to LED. Does Not Fit 2010-2013 CVO™ models or 2014 and newer models with OEM LED Tour-Pak®. 2006-2013 Electra Glide® Ultra Classic/Limited models & 2011-2013 Road Glide® Ultra models equipped with OEM Ultra Tour-Pak® or King Style Tour-Pak® with 1157 incandescent bulbs. Must be used in conjunction with Custom Dynamics® Smart Triple Play® Unit. Also fits 2008-2013 Tri Glide® models. Must be used in conjunction with Custom Dynamics® Smart Triple Play® Unit. 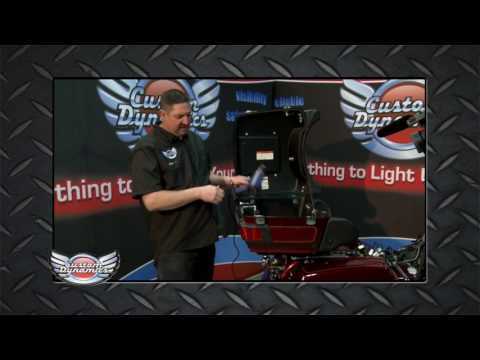 Does Not Fit 2010-2013 CVO™ models or 2014 and newer models with OEM LED Tour Pak®. Bikes with Küryakyn Panacea™ Taillight System Installed Require Special Order SMART Triple Play®. Contact Us for Details. These additional products are required for proper operation of the Magic Tour Pak® Converter. Unit must be used in conjunction with these Custom Dynamics® brand products.